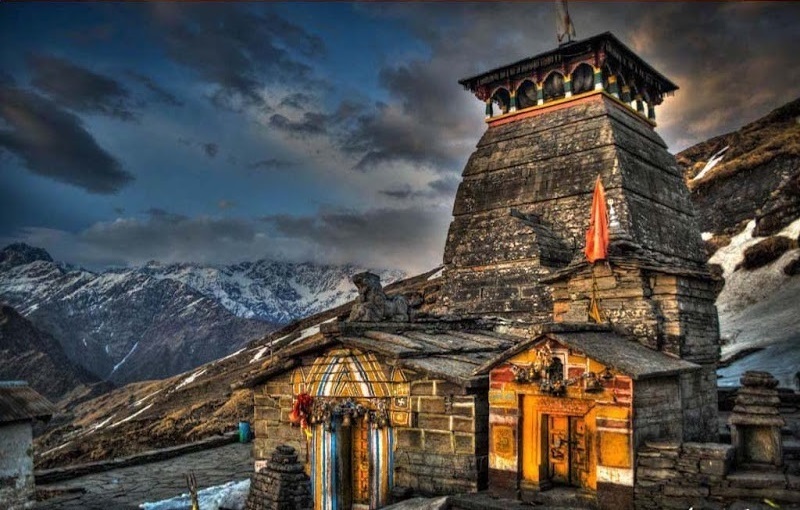 Tungnath is the highest of the Shiva Temple in the World situated at an altitude of 3680 meters. It's the third of the Panch-Kedars. Tungnath literally means Lord of the Peaks is situated below Chandrashila Peak. It is said to be over 1000 years old. According to the Legend when Pandavas, heroes of epic Mahabharata went searching for Shiva for forgiveness for murdering their own Kin on the peaks of Kedarnatha, he took the form of a bull and later on went underground when Bhima spotted him. Tungnath is where his hands came out, while rest of his body parts formed the other four of the Panch Kedara. It is said that Lord Rama and demon king Ravana both meditated here on Chandrashila Peak in ancient times. Tungnath Peak is the source of three springs forming the Akashkamini River. Chandrashila Peak is 2 kilometers from Tungnath at 4130 meters. 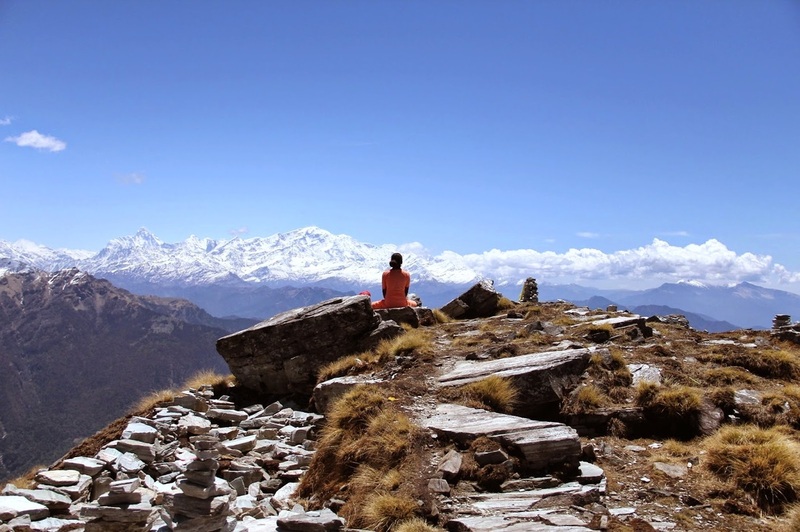 The trek begins from Chopta and is a small family picnic like trek of 4 kilometers. The views from the top are mesmerising as peaks of Nanda Devi, Banderpoonch, Chaukhambha and Neelkanth are visible. On the other side we can view the entire Garhwal Valley. The trail offers a walk across rich alpine meadows and agricultural fields. The Rhododendrons are spread across the trail and are in full bloom in March in dazzling red and pink. The region hosts the Kedarnath Wildlife Sanctuary which has a breeding center for endangered Musk Deer. Tungnath is undertaken as a part of Panch Kedara covering 170 kilometers of trekking. The others being Kedarnath, Rudranath, Madhyamaheshwar and Kalpeshwar. The Tungnath trek can be done in winters and the snow offers dazzling views and experience of a life time for the first time trekkers. 76 species of wild life have been recorded in Chopta Area, from where the trek to Tungnath begins. For more information about holy cities of Haridwar and Ukhimath, please visit our Madhyamaheshwar and Dodital Treks to have a detailed insight about the places. From Ukhimath, Chopta is 29 kilometers. It's a natural destination for nature lovers as Chopta offers fine views of the Himalayan Range including Trishul, Nanda Devi and Chaukhamba. Located at 2700 meters altitude, Chopta is surrounded by pine, deodar and rhododendron and rich flora and fauna. In Winters Chopta turns into a popular destination due to the heavy snowfall. Tungnath and Chandrashila remains covered from snow from December to March. It has a cool and pleasant climate from March-May with the temperatures ranging between 10 C-25 C. While in winters temperatures drop till -15 C. By January Chopta is covered with 4-7 foot thick layer of snowfall. An alternate route to Chopta is via Deoria Tal, which is a 10-12 Kilometers Trek from Saari Village. It's a great idea to visit Chopta in Winters as the snow covered fields give the impression of nothing short of Switzerland. Chopta offers 360 Degree views of snow clad mountains which is a spell bounding experience. Its a three hours delightful walk from Chopta-Tungnath. The first half hour is a walk across forest of conifers, ferns, rhododendrons and lichens. We can have beautiful views of Bandepoonch Peak and Kedar Massif from afar. After a few switchbacks the forest recedes and we enter beautiful meadows on both sides filled with colorful and gorgeous flowers. We can stop for some snacks mid-way at enroute shacks. From here the path catches up a steady gradient and we will come across a small ganesha temple on our way. As we reach up and the path flattens, we will come across some stairs on our left. We climb the stairs and reach a small kund (pond). From here we will cross some shops to reach the temple complex. The temple build on solid granite slabs, give a glimpse of the architecture of Jageshwar and Bageshwar Temple in Uttarakhand. There is a Nandi Bull guarding the gates of the temple and a one foot high Shivaling in the sanctum-sanctorum. There are two smaller temples outside of Godess Parvati and Sage Vyas. The temple offers breath-taking views of the valley and snow clad peaks of Garhwal. We can either take accomodation in the lodges near the temple complex or camp at the beautiful meadows after a warm hearty meal and enjoying the stroll around the nearby meadows. Although its just a 2 kilometer walk from Tungnath to Chandrashila but it's advisable to start early to enjoy the beautiful views before the clouds cover in. We will back down on the stairs we came from and take the clear trail on the left. The trail is little narrow and rocky which later turns grassy and soft and in not more than 2 hours we should reach Chandrashila Peak. It's a broad summit, strewn with cairns. There are plenty of ledges to lie down and enjoy the romantic setting with panoramic views of Mandakini and Alaknanda Valleys. There are several peaks towering infront of us including Chaukhambha, Bandarpoonch, Kedarnath, Nanda Devi, Gangotri, Neelkanth and several others. Spend a few hours here and enjoy lunch. After a while we begin our descent back to Chopta, which will roughly take 3-4 hours. From Chopta we can head towards Mandal Valley or Deoriya Tal or alternatively stay in Gopeshwar for a night near the river bed and then head back to Haridwar and Delhi. We will provide trained Hindi and English speaking guide and proper backup and safety along with Read More..